SO LONG, Kepler, and thanks for all the alien worlds. The most prolific planet-spotter ever built has shut down for good, leaving astronomers to reflect on an era of unprecedented discovery. On 30 October, NASA confirmed that, after almost a decade of service, the Kepler Space Telescope had finally run out of fuel. This means it can no longer reorient itself to point at stars or beam data back to Earth. It will spend its retirement in eternal orbit around the sun, gradually moving further away from home. 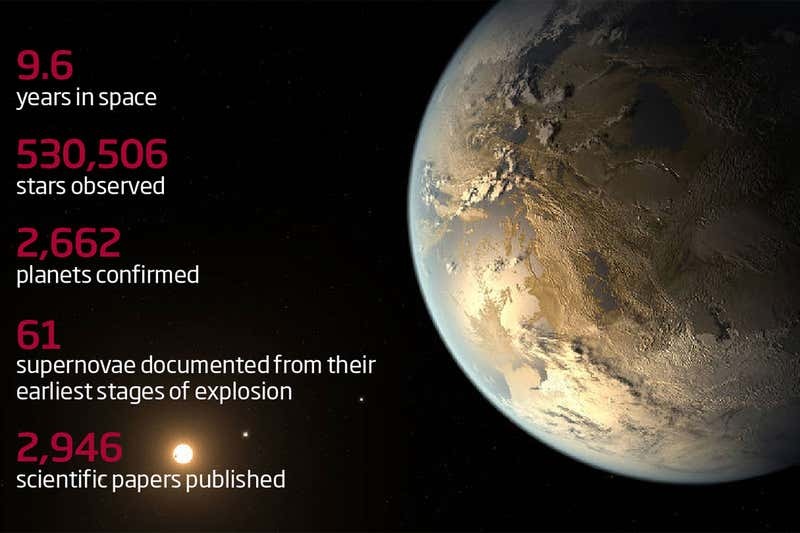 But Kepler’s legacy isn’t likely to fade. “It confirmed beyond doubt what we’d all been hoping, which is that planets are common in the galaxy,” says Joshua Winn, an astronomer at Princeton University. In the process, it transformed our understanding of the cosmos. We now know that nearly every star in the sky hosts its own collection of alien worlds, and that many of those solar systems are nothing like our own. When Kepler launched in 2009, we had spotted just 300 planets outside of our solar system. It has since identified some 2300 more and thousands await confirmation. Of all the exoplanets we have found, roughly 70 per cent were spotted by Kepler, which searched a small patch of sky for tell-tale dips in the brightness of stars as alien worlds passed in front them, known as transits. The numbers are impressive. What really changed our perspective, however, is the incredible diversity of planetary systems among the haul, and the surprises they contained. We saw gas giants and small, rocky worlds orbiting their stars closer than we thought possible; planets orbiting two suns, like Tatooine from Star Wars; and planets that almost share the same orbit, which should be a recipe for disaster. “Kepler really pulled back the curtain to reveal all sorts of weird and wonderful systems that might eventually help us to understand the process of planet formation,” says Winn. It also taught us a crucial lesson about where to look for worlds that could harbour life. Its mission was to search for Earth-like planets in the habitable zones, where conditions are favourable for life, around sun-like stars. It found a few – 30 at the last count – but it turns out that potentially habitable worlds are more common around cooler, smaller red dwarf stars. A hallmark of these colder stars is that their habitable zones are much closer in, which means planets residing within that sweet spot pass their star more often. That makes it easier to find and study them, and explains why some astronomers have now shifted their focus to red dwarfs. “Kepler laid the groundwork for that, and for all the new things on the horizon now,” says Courtney Dressing at the University of California, Berkeley. NASA has already launched Kepler’s successor, the Transiting Exoplanet Survey Satellite, which will scan most of the sky, taking in at least 200,000 nearby stars. Then there are several ground-based observatories, including SPECULOOS in Chile’s Atacama desert, which has had its sights trained on 500 ultra-cool dwarfs since December 2017. Its prototype discovered seven rocky planets around a star called TRAPPIST-1, three of which sit in the habitable zone. “The advantage of the planets SPECULOOS is finding is that atmospheric investigations will be possible,” says team member Amaury Triaud at the University of Birmingham, UK. We can already see some weather on alien worlds (see “Weather forecasts from alien worlds are in – and it’s wild out there”), but not in much detail. SPECULOOS and other new observatories like the James Webb Space Telescope will let us learn more about the conditions on other planets – and determine if any of them might be conducive to life. This article was originally published by Newscientist.com. Read the original article here.